As PartsRiver, a leading provider of data quality management tools to the heavy duty truck parts industry, prepared to introduce their new software application which enables buyers to find parts and local sellers, they launched an extensive review of their current branding practices along with the development of a complete marketing and launch plan. Connector Branding and Roaring Pajamas and collaborated to create a brand that quickly communicates a key benefit to buyers of making their jobs easier and then developed the user experience of the application to deliver on this promise. To achieve that goal, a comprehensive branding strategy and brand architecture were developed first. Following a comprehensive naming phase, Part Search was selected as the ideal descriptive name which best fits PartsRiver’s corporate dominant brand architecture. Next, a compelling web design including Part Search user interface, SEO optimization, copy and build-out on a WordPress platform were developed. The entire site was then turned over to PartsRiver’s internal development team to adapt it to a custom platform based on a Zend CMS Framework. A complete marketing plan was developed to prepare for the brand launch by extending the basic Look and Feel of the site to sales materials, tradeshow booth, email campaign and print/online advertising. A full range of social media tools, based on a wide-ranging strategy including blog, Facebook and Twitter sites were created and authored. 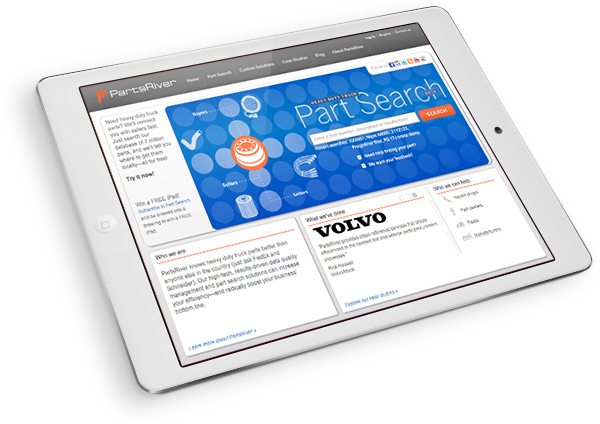 Part Search was successfully launched at the 2011 ATA Management Conference & Exhibition in Dallas and now has over 10 million parts indexed to help buyers find parts and local sellers.